Every book I read growing up convinced me that I needed to have a "best friend." I had good friends in high school, but I wanted one person to confide in. Leave it to me, the lover of hate-to-love romances, to find a best friend in the one girl I'd always said I couldn't stand. She was nothing like I'd imagined, which taught me to stop assuming I knew anything about other people. For years, we'd laugh at the way our friendship started. With that crazy beginning, I thought I'd found someone who'd be my friend for the rest of my life. Things changed in college. It didn't happen overnight, but I didn't see it coming either. It felt like it was happening at the worst possible time, and the whole situation was isolating and lonely. I was heartbroken, and it changed something in me. It sounds a little dramatic, but it's like I was mourning the friendship. I was, to be honest, bitter about the whole thing. I became insecure about my other friendships and distrustful of people. Around this same time, I moved into a house with two of my closest friends for my junior year of college. I was excited about living with them... but also kind of dreading it. You see a different side of people when you live with them, and I wondered what would happen next. One of those friends was a girl named Lauren. She was in my sorority, and I’d known her since freshman year. And despite all my insecurity about friendship at that point in time, I realized that I liked her even better the more I got to know her. Fast forward eight years, and I recently got home from a trip to the beach with her. We ditched our husbands and spent five days in the Keys. It was, quite honestly, heavenly. We read books, ate an insane amount of chips and salsa, talked about the important and the silly stuff, shared memories and made new ones. And at one point on the trip, the thought crossed my mind – I would have missed out on this if I'd let my bad experience define my feelings on friendship. 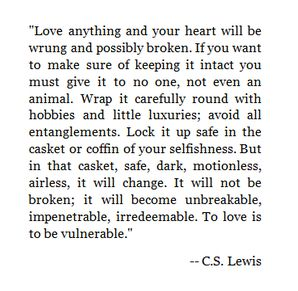 It's scary to to open your heart. It feels like a risk, and the reward isn't guaranteed. Sometimes you'll show a part of yourself to people who won't really see you. You'll let people in and later have to let them back out. You'll have friends for a season that you thought would last forever. But then there are moments that prove it's all worth it. There are people who remind you that being brave and loving deeply is how you're truly known. The friendships with permanence, the ones that change you from the inside out, are the ones that are honest. I can talk to Lauren about everything from the color I painted my nails to the pain of dreams deferred. But at the end of the day, I'm often still cautious in friendship when I want to be courageous. So while my vacation offered much-needed relaxation, it was also an overdue reminder that there's beauty in loving other people. Eight years ago, I met Lauren and liked her. We went shopping for socials and debated options for date nights. We'd walk together to tail gates, and sweat our makeup off in the sun. We'd watch The Bachelorette in pajamas and had no shame in being the only adults in the theater for the Justin Bieber movie. We'd dance on bid day, roll our eyes at chapter, and tried to solve the mystery of who was stealing food from the snack room fridge. In Pride and Prejudice, Elizabeth asks Darcy when he began loving her. He responds by telling her, "I was in the middle before I knew that I had begun." That's what happened with Lauren. In the midst of all the silliness and shenanigans, I got to be real with her. It made all the difference, and my life is better because of it. You never know who those people will be for you, but don't you want to find out? As a freshman in college, I didn't know where I'd be today. I lost one friend, but I gained one, too. One friend broke my heart and another friend helped it heal. And here's the thing – I'd go through it all again to end up where I am now. I can invite people into the mess or only let them see through a filter. I know which one feels safer, but I also know which one leads to real friendship. I don't want to give up the chance at laughter in order to guard myself against tears. I want to show up – in the big moments and the small. To apologize and forgive. To ask questions and tell jokes. To be brave and a little scared. To see someone's story and be seen in return. So, here's to the friends who inspire all of that and more. WHEN YOU LOOK FOR IT: Have you seen / do you watch Gilmore Girls? This section made me think of Rory and Paris, the hate-to-love friendship they have. WHEN YOU LET IT GO: I had a similar experience! This was in middle school, so be aware emotions were running high. She was going through a very tough situation and I couldn't handle it anymore and told a guidance counselor. She became angry with me, and to this day when we happen to run into each other at mutual friends' events, we have a hard time speaking. WHEN YOU LEAST EXPECT IT: YES! Living with friends can be incredibly fun or the exact opposite. You really lucked out! The friends I've lived with (either in college or together in a hotel room on trips) have been great too, but you really learn so much about them even after a couple of days. It's eye-opening. WHEN YOU OPEN UP: Awww, yes, this too. I've some friends I've known since we were 10 or 11, so they've seen the whole growing-up process -- and even then it's hard to speak up about something good or bad, small or large, life-changing or dull. But friends, true friends, are your #1 cheerleaders. It's in the unwritten contract that they'll be there thick or thin. Just sitting here nodding along to everything you said in this post. :) I don't want to give up the chance at laughter in order to guard myself against tears. <--I especially loved this, and it really resonates with me because I feel like that's what I do all the time. I've had so many ups and downs with friendships, and I've never found that ONE person, that one best friend who I could be myself with. I thought I did find that person during freshman year in college, but like you, I got my heart broken with that. I don't think it's dramatic at all, to mourn a friendship. It hurts a lot, especially when you were close with that person, when you let them in farther than many others. I also had a group of friends during that year, and I thought it would last, but it didn't. And it made me retreat back into myself, and I haven't worked up the courage to find other people, ones who will actually want to stay in my life. I do have one from high school, basically the only friend who knows me the best, but I still don't share everything. But I think that's more ME and not her, more that it's because I have a hard time opening up to people and letting them in, in sharing my pain as well as my happiness. Friendships are hard, and sharing pieces of your soul is hard when you know that you can lose it all. But it can be worth it, and that's something I need to remember, and something I need to have more courage in. I love this post so much and I'm quite envious actually. I agree, it does seem like in books and tv shows and movies, it's normal to have a best friend... I'm that person that's never really had a best friend though, at least in the physical sense, I do have one that I talk to online. The When You Least Expect it part made me think of a friend that I do have. During my freshmen year of high school, I had two roommates. It was through one of these roommates that I met her own friend, of course, I didn't get along with that roommate or her friend very much. Me and her friend were actually very far from liking eachother for about three or four months. We argued a lot. Funny enough though, the second year, we were roommates, we've gone to concerts together, I've spent a week at her house and out of her and my former two roommates, she's the only one I talk to. We're not best friends by any means, but the fact that we're friends at all is really surprising and funny. I'm really happy for you though despite my slight envy, It's amazing how even though you lost someone who you considered to be your best friend and then found another at just the "right" time almost. it's great to find a person that you can really share part of yourself with, good or bad, light or serious, who you know isn't going to walk away from you. I don't have a best friend and I'm not sure everyone really does, one of my friends who is a complete inspiration to me and at ten years older also has a lot of wise advice once told me that people come into your life for a reason, sometimes it's just for a short time, sometimes for a long time but we should cherish each person who comes into our lives as each has something to teach us whether it's about love, life, friendship or ourselves. We talked about this on twitter a bit, but I really resonate with this post. I always thought I should have a best friend too, but most of the time it was groups of friends. And people would change and slowly my group would change too... I always thought it was me. That there was something wrong with me. But I've come to realize that the people who are important always find a way to stay in touch and be there for you. My high school friends all stayed in the same area and I moved away to college. It was natural that we grew apart but it was hard for me for awhile. I was always the one trying harder to hold on. Now we are all friendly again and it's ok that we're not best friends. I realize that. And I mentioned my toxic guy friends to you... it really hurt and still does. I think about them and wish it could go back to how it used to be, but they are clearly not worth it. They said hurtful things and stopped keeping in touch and that's their choice. I love the story about you and your friend Lauren- it's so sweet and so true. Friendship, especially when you get older, is like dating. I would worry about when I could call or text, could I make this silly joke, etc and somehow you just fall into friendship with the right people. I have a really close group of about 4 girls that I met in college/after college and they are my people. I met Lauren through her ex bf, and met Christine through Lauren (they grew up together) and met Jenelle through Christine (also grew up together!). And we all lived together at one point! It was one of those things where you know if your best friend is friends with this person, you'll like them too. It's a good feeling. 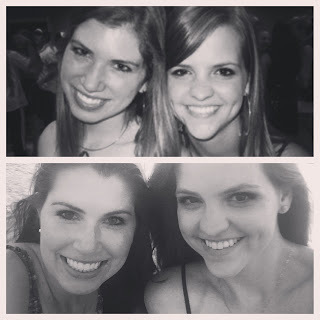 It's taken me a long time to realize that friendships evolve and to not feel guilty about that. Always a learning process :) Thank you as always for your wonderful post and for letting me babble. Wow, wonderful post. This made me want to go and give my besties a hug!